Idia’Dega is a global eco-design collaboration: creating apparel, accessories and jewelry combining Indigenous design with sustainable fabrics. We are artisans linked by cultural, social, environmental and economic self-empowerment of women. 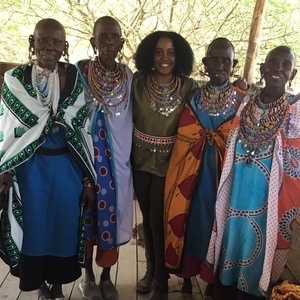 Our partnership includes OMWA: Olorgesailie Maasai Women Artisans of Kenya and of the Oneida Indian Nation: The Beading Wolves and Beading by Holly. Our collaborative design model is working on: Renewable energy solutions and a digital design application. Sign up for our newsletter to follow our events, attend events and spread the word. Follow: @IdiaDegaFashion on Instagram and @IdiaDega on Twitter. Visit our online shop at IdiaDega.com, tell a friend, share the link. Shop our work - the women in our collaboration make money throughout the design process, but the sales is our thing. Connections with renewable energy professional to help us bring Maasai Solar a reality. Contact with developers who would be interested in discussing our: Enkop App - a virtual studio app. Investment in resource, material and fabric acquisition for future collections. Funding support for Maasai Solar renewable energy product development. Fashion industry support through representation with a showroom or via trade show.